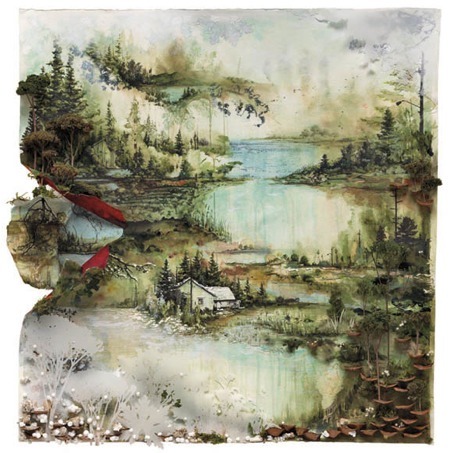 We brought you the exciting news just a few weeks ago that we were expecting a new LP from Justin Vernon’s Bon Iver project to come out in June. More details have now become available, the record will be self titled and will be released through Jagjaguwar on June 21st. After the unexpected and international nature of the success of For Emma, Forever Ago and the beautiful, ethereal tones of the Blood Bank EP the new record has a lot to live up to, and already it looks like a different proposition to its predecessor. The tale of the debut album is well known but it looks like this latest albums recording and creative process involved a lot more collaboration, more complex instrumentation and sounds. Recently a mysterious video appeared on Bon Iver’s website , soundtracked by a sparse, atmospheric guitar line which surely must be a teaser of an album track. The video features an image of a painting which accompanied the announcement of the record so it’s safe to presume it’s the cover art. Check the video, artwork as well as the geography of Northern America influenced track list below. This entry was posted on 20 April, 2011 at 3:49 pm and is filed under News with tags bon iver, Jagjaguwar, Justin Vernon, news, Sean Carey, Volcano Choir. You can follow any responses to this entry through the RSS 2.0 feed. You can leave a response, or trackback from your own site.